On 14th, it took me about 2 hours from London to Bath by car. 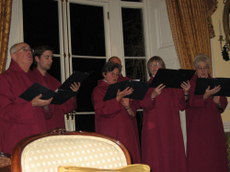 The Hotel Luckman Park（picture 1）on the outskirts of Bath which is an extensive manor was used as the venue for the conference. They hunted fox in the olden times. 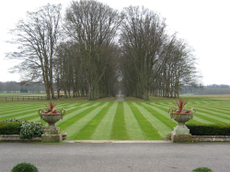 I have been to such places in Britain several times, one can feel the British wealth. Presently there is a conference, but it is so cold and looks like it will rain and I do not feel like going outside. Anyhow, we had lunch after we arrived and after taking some rest for a while most of the time was spent for the Carnegie meeting which is our objective. On the 15th, all the members except from Germany participated in the conference. I offered topics such as the G8, TICAD etc. to be held in Japan in 2008, Millennium Development Goals which is on its half way stage in 2008, and newly developed Environment Council report draft. The news flash of “COP13” of Bali was in the afternoon, and in the evening there was live coverage on TV by staffs from London and Lord King responded. This nice media work and swift response of British government is impressive. At night we had a tour of Bath. The guide guided us very politely. The temperature was below zero and it was very cold. We walked in the town for about 30 minutes. We had the dinner at Luckman. On the 16th there was a meeting in the morning with Shelpa. We discussed on the 2008 G8 summit, macro level science policies, low carbon technologies etc. After the conference, I had a brief chat with Minister Nishigahiro, First Secretary Matsuura etc. who had come the previous night from London. 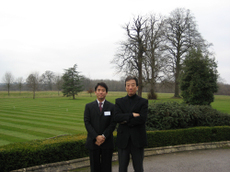 After relaxing for some time, went to the Heathrow airport with Counselor Itakura. I arrived at Narita on 17th Monday afternoon. A short trip is nothing new to me but altogether it was a 100 hours journey which was tiring..
Well, its just 3 weeks before year end. I left for London on December 13. 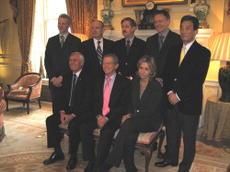 From 14 to 17th, there was the Carnegie meeting where G8 Scientific advisors and Ministers gather. As soon as I arrived in London, I took some rest and headed towards Royal Society. 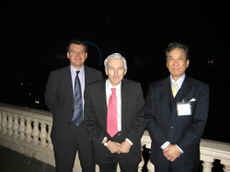 I visited the chairman, Lord Martin Rees（ Photograph 1）. 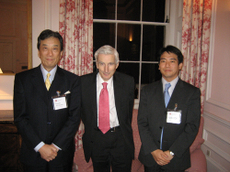 Ever since the 2005 Gleneagles G8 Summit, there is a close cooperation between the Royal Society and the Science council of Japan. Some activity is expected from the Science Council of Japan in the next G8. 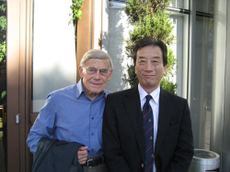 I had dinner (I also had dinner in January this year) on the 13th with His Excellency Nogami at his hotel. Mr. Nishigahiro, the Secretary General of Science Council of Japan up to beginning of this year, Mr.Takaoka, the Minister, Mr. Matsuura the First Secretary, Mr. Itakura, Counselor and Mr. Nomura from the Venture Capital who specialized in “Clean energy” at London base , who also participated in Abu Dhabi in November were with me. Mr. Nogami, the Ambassador is not just in politics but is also familiar with economics as well. He also participates in events such as the annual meetings of British (POW) who were Japanese captives during the World War II and if anybody expires, attends their funeral services at any cost. This may not look very spectacular but such inconspicuous action is the basis of diplomacy. It is after all human beings who connect to each other. At any rate, the GDP of England has grown up to 40% in 10 years. It is mainly centered on the service industry but the financial power is also formidable. Lately the transaction amount of the City has exceeded the NYSE. In addition, due to subprime crisis in the USA, investment and people both are coming towards City. I came to know later that the investment including entire bonus of the City this year is enormous (one trillion yen!) which reflects the prosperity of the business conditions. The information related to this, policies, sudden drop in the popularity of the Prime Minister Gordon Brown etc. Analysis of the Ambassador Mr. Nogami is quite something. The talk just went on and the dinner meeting continued till midnight. Thanks to Ambassador Nogami and to all of whom I had pleasure to meet. Recent issues in two leading business weekly journals have highlighted Japan. One is The Economist and another is Newsweek of its international version. 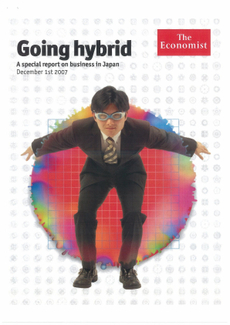 The Economist, December 1st, states in the cover, ‘A 14-pages special report on business in Japan’ and the title is ‘Going Hybrid’ http://www.economist.com/specialreports/displayStory.cfm?story_id=10169956, consisting of five reports; they are；1）Message in a bottle of sauce； 2）Still work to be done； 3）Not invented here； 4）No country if an island； and 5）JapAnglo-Saxon capitalism（no spell error!）. Though the title of reports may look attractive, the special issue as a while emphasizes as might be expected, that business in Japan is moving perhaps toward to right track, but the speed is the issue. If you see the subtitles of each, the message may be a bit clearer even without reading it. 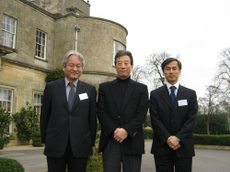 5）JapAnglo-Saxon capitalism; Have Japan business practices changed enough? The special in the Newsweek, December 10th issues, is more straight. 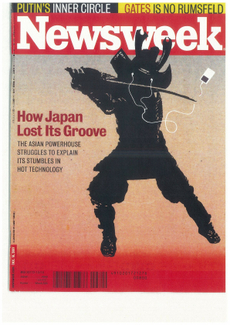 The caption in the cover reads ‘How Japan Lost Its Groove; The Asian powerhouse struggles to explain its stumbles in hot technology’ and the title of the report is ‘Why Apple Isn’t Japanese’ . My friend, Yoko Ishikura, was one of interviewees and her comments can be read in the On-line version as stated in her blog. The world is watching what Japanese business will do, is trying to become of, and what it will act upon. California-3 after a long time, Address at the Stanford University. On the 6th, it was a gloomy weather since morning. Was raining a bit. First, I met Ms. Shizu Munekata of Enhance Inc. (is she is known as “Ms. Shizu”?) and spoke with her on broad topics and we spent a very good time. Then at lunch, I met Dr. Kaneko who is becoming a legend in bio technology (also profiled in the “Going through the digital era” of Mochio Umeda) after 3 years, and Ms. Chika Watanabe of blog and “ Human 2.0”. It was a strange feeling like knowing the person well, even though all were meeting for the first time. After lunch, I met the people of the biotechnology venture of Circulatory organs in the Silicon Valley. We discovered many common friends in the board members of the companies, like coming in groups. This is really what excites me. You can never tell who you will meet as you visit places. The reputation of every person spreads unknowingly, and it gets established in this “Flat” society. This will become “Individual power”, moreover “Trust” of the global era. It is hard to understand who is connected to whom. Therefore it is necessary to be alert. In every case one should give his best with honesty and sincere efforts, and should improve his ability. From 3 pm to Stanford with Prof. Mr. Dasher. It was raining a little, like needing an umbrella depending on the walking distance. After visiting his office, I did the last lecture on the series of “Innovation of Asia” from 4pm. Not only the students, but also foreign students, faculty members from Japan, many other people from outside the campus , and local celebrities were there to many of whom I was introduced to. The title of my lecture at the seminar was “Innovate Japan”. I started my speech by explaining how Japanese people start any discussion with a sort of apology or humble attitude like “Thank you for coming today despite of the bad weather”. The point of discussion was what I already said before, (In this case Web cast)-that the Noble prize for peace for 2006 and 2007 represents the key to the innovation boom of the globalization era, and that Silicon Valley as the resource of free unrestricted ideas is now turning into the “Clean Green Valley”, the mecca of “Clean Green Technology”. This seminar will be on the web soon so please wait for the contents and the questions and answers. Photo 2 With some of the participants after the seminar. Nevertheless, this is the frightening aspect of the information era. Any one can see this picture all over the world. This essentially is the frightening aspect of the “Global era”. The image has more impact than just the words, just like live, nothing can be concealed. In most of the cases, everything is almost instantly seen and known in real time. In the “FLAT” world, anybody can see it. Who is he? What does he do? What can he do? How good does he do it? Within no time, it is widely known throughout the world in a form that anybody can see. A title does not have much power. The value of the “Individual power” that crosses the national borders, is the essence and the message by Dr. Ishikura and me in our Japanese book “How to make a world class career”. Now the whole world knows how much the value of “high” title in the Japanese society actually is. This cannot be concealed no matter where you go or what you say. Higher the position in society, if there is “difference in the actual ability”, then in the global era, it affects the liabilty of that individual, the organization, the society and the nation to which he belongs. To tell the truth, I am scared. However, actually this is a good education. We should get a feedback from the people, students and from the counterpart and self-analysis should be done. Here we have to learn and make the best use of it. I think this is important. To watch oneself and learn in modesty and move to the next step is what “Self Improvement” process is all about. Many questions came out after the lecture. After we finished with the questions, I was with everyone as usual (Picture 2). Many young people from the Japanese industries (mainly big industries) and from the universities had participated. One woman had come from the nearby high school, she wanted me to come to the school and speak and so I replied her through e-mail that I would come in the next chance. Thank you everyone for coming in spite of the bad weather. Thank you. Thanks to Mr. Yagi of IMAnet for attending and for writing about this in his blog. Thank you. On the evening of 5th , I arrived at the San Francisco airport after a 2 hours delay, and was welcomed by Mr. Deepak Bangalore (Called as DB), who was also with me at the Global Innovation Ecosystem 2007（GIES2007）, his daughter who attended the Oxford University and Ms. Hoshi of the Panasonic whom I met at the World Knowledge Forum held in Seoul . We went straight to Palo Alto, the town of the Stanford University, at the heart of Silicon Valley (SV）. We went to “TiE”（The Indus Entrepreneurs）. As the name suggests, this organization has several offices and many SV Venture Capitalists and entrepreneurs were there. The members mainly consisted of Indians many of them connected to each other in some way or other. If you look at the website, you realize that it is full of activities every day. It looked like they were mostly Indians. Around 100 people gathered around the table and exchanged opinions and information having wine and light snacks. It was clearly an atmosphere of casual confidential talk. Many people were introduced and visiting cards were exchanged. I was told that such extremely open gatherings took place every 2, 3 days a week. How energetic. Can such gathering be imagined in Japan? Maybe few attend every time but I never thought that so many people, may it be entrepreneurs or scientists or investors, would gather together so frequently. This is probably one of the secrets of the SV strengths. The “TiE” network has been spreading widely in the world. I am impressed with the Indian strength of organizing and providing this. This evening, Dr. Burton McMurtry who is called the “Pioneer of Venture Capitalist” did an interview style speech at Stanford University Chair, Board of Trustees. It was wonderful. This kind of people are the regulars. Even Mr. McMurtry looked like a lay person and didn’t appear to be so special. But lots of Venture Capital information is exchanged through such gatherings, and human resource training/education, business strategy network building, result achievements are discussed and put into practice. This might be the secret of SV success. It is incredible to have many such extremely open places. I left early for dinner with DB and his daughter, Ms.Hoshi, Mr. Hirose of Hitachi, Mr. Masa Ishii (former McKinsey, a Venture Capitalist established in SV), joined later by Prof. Richard Dasher (our host at Stanford visit), who had just returned from a meeting of Tohoku University. Well, we had a lively discussion on wide range of topics, and there was an after dinner session with Mrs. Ishi. This evening’s host of “TiE”, the incoming chairman Mr.Vish Mishra were also with us. It was a long but enjoyable day. Dec. 4th, I flew to California. First of all, I had lunch at Napa Valley Grille at Westwood, with my ULCA mentor, Dr. Kleeman(Photo1) and his wife. 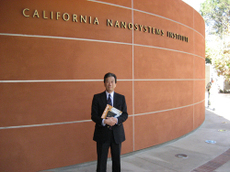 Then, I went to the newly established California Nanosystems Institute（CNSI）(Photo2). This is yet to be fully opened but some work has already started. There are joint research programs with the University of Tokyo and National Institute for Materials Science(NIMS) at Tsukuba, and I am happy to hear it. 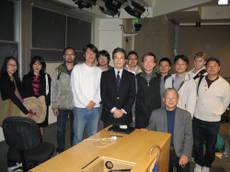 I met there Prof. Matsui of Kyushu University Silicon Valley Office was also visiting. Since the research conducted over here is a joint work related to medicine, engineering, and chemistry, the research laboratory is constructed right in the center surrounded by these departments, and various ideas are applied to the system of how the researchers will participate. This NanoTech Center aims to collaborate with Bio and also works in collaboration with Univ. 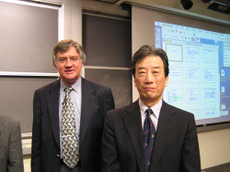 of California Santa Barbara (The place where Mr. Nakamura Shuji who discovered Blue Diode was head-hunted) which focus mainly in the Nano material area. I met several researchers and also met 2 Japanese scientists. They are doing very interesting research projects. They are involved in their research from past 10 and 20 years, respectively. They are working hard. I wish both all the best. On the next day, I met Dr. Gerald Levey, Vice-Chancellor of Health Affair and Dean of School of Medicine. We knew each other for some 12 to 13 years. We greeted each other and talked for an hour. 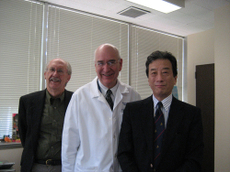 Then I had a meeting with the professor of pediatrics, Dr. McCabe(Photo4), who is a friend of Dr. Eto of Jikei University, both work in the same field, thus genetics of pediatrics deseases. Dr. McCabe raises horses at the Doublestrand Ranch from the time he was at the Colorado University. He is not only brilliant but the scale of activities is big. I am envious. 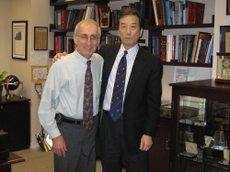 Photo1　With my Mentor at UCLA, Dr. Kleeman. Photo2　In the UCLA California Nanosystems Institute(CNSI). 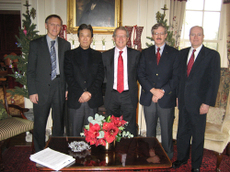 Photo4　With Dr. McCabe, Dr. David Lundberg(In-charge of UCLA-CNSI international cooperation administration). I still miss my university where I studied for quite a long period. The penetrating blue sky of California which seems to beckon me to come back. The unending bright campus, the University town, Westwood, I miss every part of it. This is my 24 hours visit to UCLA, that I feel I wished I could come back. I headed towards the airport and went to San Francisco. By the way, the flight was late by around 2 hours and I reached in San Francisco at 5: 30 pm.